School's out. We all know what this means. It's Family Vacation Time! This is the time of year for people to travel, and come home with the “crud.” From “cruise crud,” to the generic “I traveled to a different country and came back sick,” or even “I went swimming in a strange body of water and now I don't feel very good.” We all deal with these things when we travel. Between the stress of travel helping to lower our immunity, and being introduced to unfamiliar pathogens, most of us are familiar with the concept of being sick after our vacations. So I figured that I'd help you out and introduce you to a common herb that can prevent a lot of travel illnesses. Most of us are familiar with Oregano, Origanum vulgare, from a culinary standpoint. It's always been one of those herbs I cook with on a regular basis. Which is awesome because it helps protect us from some of the toxins created during the cooking process. However, it's also a valuable herb in my medicine cabinet. 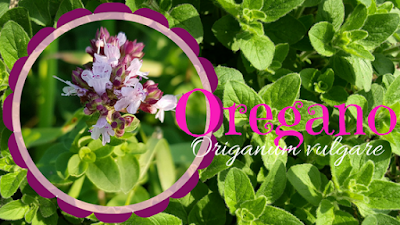 Oregano is a member of the Lamiaceae family (also known as the Mint family) which also includes a wide variety of other, common, culinary and medicinal herbs. This was the first plant family I ever learned to identify in the wild. Which is a very useful skill to have as every plant in this family (that I am aware of at least) is edible and useful for a few common ailments (typically upper respiratory and digestion related). The botanical name is Origanum vulgare. Common names include Oregano, Origano, Common Oregano, Garden Oregano, Wild Marjoram, Winter Marjoram, Mexican Mint, and Wintersweet. Oregano is anti-inflammatory, antifungal, antibacterial, antimicrobial, antiseptic, antiviral, antispasmodic, antioxidant, diaphoretic, expectorant, rubefacient, bitter, carminative, emmenagogue, and diuretic. 1 teaspoon of dried oregano contains: 5 calories, 0.8 grams (g) of fiber, 29 milligrams (mg) of calcium, 0.66 mg of iron, 5 g of magnesium, 0.09 mg of manganese, 23 mg of potassium, 0.33 mg of vitamin E, 11.2 micrograms (mcg) of vitamin K, and trace other vitamins and minerals including folate and vitamin B6. Called Tu Yin Chen in the TCM world, Oregano is used quite often to help with colds, fevers, vomiting, diarrhea, jaundice, and malnutrition in children. It's known to help promote qi circulation, clear heat, and expel wind. Especially useful to clear wind-heat. Oregano, known as Sathra in Ayurvedic Medicine, enhances pitta deficiency and reduces kapha and vata excess. All the benefits of oregano as an herb can also be had from the essential oil, as essential oils are super concentrated versions of their corresponding herb. However, oregano essential oil is among one of the strongest essential oils I tend to personally use. This is the easiest form of oregano to take with you on long trips, and it's safe to take internally as long as it's diluted. You can also use it in a salve, lotion, or liniment for skin disorders, as an insect repellant, and to help stop the itch of insect bites. It's also a great essential oil to add to a diffuser, especially during cold and flu season. Not only does Oregano have a mild anti-viral effect, it also is antiseptic, anti-inflammatory, and helps to eliminate toxins. This makes it a must have during cold and flu season. Just a few drops of oregano essential oil in water or orange juice helps to soothe a sore throat and reduce the symptoms of the common cold. Preparing a tea with oregano leaves can help relieve the symptoms of a severe cold in 5 days, when drank 2-3 times a day. Two of the active constituents found in this herb is rosmarinic acid and thymol. Both of these constituents are strongly antioxidant and help to boost the immune system. Oregano's carminative properties help improve digestion and reduce flatulence. It's also packed full of fiber, which helps aid in the digestive process, as well as increase nutrient absorption. Oregano contains omega-3 fatty acids which help to improve heart health. That, along with it's anti-inflammatory properties, helps to reduce inflammation in the cardiovascular system, balance out cholesterol levels, prevent heart attack, prevent atherosclerosis, and prevent stroke. Oregano has some amazing antibacterial properties. This herb has been shown to help protect against a wide range of bacteria that can affect the skin, gut, sinuses, lungs, and many other areas of the body. t's even been shown to be effective against quite a few superbugs (https://newsinhealth.nih.gov/2014/02/stop-spread-superbugs), including MRSA. It also stimulates the immune system, resulting in an increase of the production of white blood cells, which also makes for a faster recovery. Carvacrol, one of the constituents present in oregano, has been shown to be a major inflammation reducer. There are a number of studies being done to test how good oregano oil is at reducing inflammation in various parts of the body. Some of the more positive results involved inflammation in the colon. Oregano has amazing antifungal and anti-parasitic properties, as well as antibacterial ones. It helps get rid of athlete's foot and nail fungus. It's also been shown to be super effective against yeast infections caused by Candida. It's also effective against Listeria monocytogenes, a common food borne illness. Oregano actually helps ease the pain of menstrual cramps. It also helps to regulate normal menstrual cycles and relieve the negative effects of menopause. Just drink a tea made from the leaves (or chew on some fresh leaves) twice a day. Rubbing fresh oregano leaves on exposed skin can actually help repel insects such as mosquitoes. You can also add a drop or 2 of the essential oil to any body spray to achieve the same effect. Some people who are allergic to mint may experience a mild reaction from oregano. Large doses of oregano and oregano essential oil may cause stomach discomfort. The essential oil can also interfere with the body's ability to absorb iron, so pregnant women and anemic people should avoid use of oregano essential oil. Never use an essential oil on your skin without first diluting it. I only included a basic introduction to this amazing herb. I hope you have learned a new appreciation for oregano, other than as a great way to flavor your food. If you have any questions or comments, please leave them below.